Normal compost is far too heavy for your planters. It will not drain very well and will harden into a solid block if it dries out'. Many people mix their own planting mediums. If you have the time and inclination producing your own medium can be cheaper as well as your being able to to tune the ingredients to suit your plants needs. Before you begin to add your plants to you planters. When planting is complete, water again and add a layer of mulch on top to lock in the moisture. 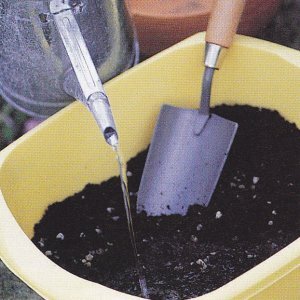 You will also need fertilizer or compost to supply nutrients for your plants. A simple lightweight blend is one part organic, one part inorganic, with some nutrients. Experiment if you like it will be evident if the mix is not correct for your plants. Most compound fertilisers will contain three elements essential for growth, NPK which stands for Nitrogen (N) Phosphorus (P) and Potassium (K). These elements help plants grow in different ways and an understanding of this will help you when choosing the correct fertiliser for a plant or for a stage in the development of a plant. When you buy a packaged commercial fertiliser you will see an analysis of the NPK content. An equally balanced fertiliser may be described as 5:5:5 - 5% Nitrogen, 5% Phosphorus and 5% Potassium. You may also see Potassium described as Potash. There are two basic kinds of compost: those containing soil and those that are soil free and are based on peat. If you are concerned about the environmental effects of cutting peat, choose a soil-less compost made with a peat substitute. These are usually based on coir. And may need extra fertilisers and more frequent watering. Proprietary 'planter' or 'multipurpose' composts are generally soil-free with a slow-release feed. Wetting agent and sometimes with water-retaining gel added. All soil-free composts contain additives, such as lime lo reduce their acidity, sharp sand to improve drainage, and a fast-acting fertiliser. They are excellent for a summer display, but tend to tire quickly, so are less suitable for permanent plantings. Lighter than soil- based composts, they are a good choice for balconies and roof gardens. Composts containing soil are a mixture of loam, peat and sharp sand, and are largely based on the 'John Innes' formula. They contain varying amounts of fertiliser, depending on what they are to be used for. John Innes No.1 contains very little fertiliser, making it suitable for young plants, which do not grow well in high levels of plant food. John lnnes No.2 has twice as much fertiliser as No.1. It can be used for fast growing young plants and for slow growing plants which will be over-stimulated by too much fertiliser. For large or mature specimens use John Innes No.3. This contains three times as much plant food as No.1 and will sustain plants in the same planter for several years. If you want to grow thriving acid-loving plants, such as rhododendrons, you will need an acid compost. These composts are lime free and are usually labelled 'ericaceous'. They also have plant foods added. Some arrangements are so dense that the surface of the compost is hidden. However, if the compost is exposed, it is vulnerable to invasion by weeds, and moisture will evaporate from it in hot weather, making frequent watering essential. The answer is to cover the compost with a layer of mulch. 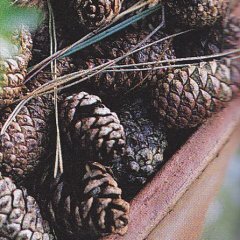 Bark chippings and cocoa shells sold for mulching garden borders are also suitable for planters. 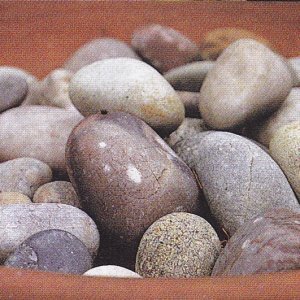 Heavy mulches, such as pebbles, have the extra benefit of adding weight to plastic planters, which might other-wise blow over. The extra weight can also help to deter doorstep thieves. Use a mulch to add an original decorative touch of your own to a planter display. Think about your planters and the plants you are using and choose a mulch that will set them off to perfection.